The SEAM360 is the ultimate machine vision double seam can inspection gauge. The system is used for both three piece and two piece beverage and food cans. The SEAM360 comes in models for beverage, food, oil filters and even a fully automatic model for operator-free measurements. Conventional seam scan technology sample seams at 2-3 points around the can. However, what about the points in between the sample points? If you measure at a few points around the seam, using a micrometer or seam thickness gauge and destructive tests with a double seam scope – you’re missing most of your information! Problems can arise as close as a few millimeters from your measurement point and you will not detect them. This means that if a problem is missed, it can be a few more shifts before the problem is detected – resulting in many bad cans being closed or even shipped! Instead of trying to measure every can (100%) but at a few measurement points, the SEAM360 measures every can’s total external surface area. This exposes many issues that were so far invisible to the operator. X-ray systems measure at only a few points around the can, and pressure systems on the seamer can miss even obvious issues because of their technology (e.g., false seams). Using non-destructive optical technology, Quality By Vision’s new SEAM360 is capable of detecting all of these double seam issues in a fraction of the time it takes to do a seam test and with no operator influence on the results. SEAM360 is the first system capable of checking every point on the seam, so there’s no chance of missing anything. This means problems with the seamer, loose or tight roll and chuck setups, double seam issues (including rare ones) are easily detectable for any seamer head. The intuitive software clearly points out what the problem is and where it occurred. Many tooling and seamer related issues can be fixed quickly, using the Clearance Gauge. Laboratory – SEAM360 tests one can at a time in a lab environment. Continuous – SEAM360 grabs a number of cans off the line every X minutes, tests them, and alerts when there is a problem. 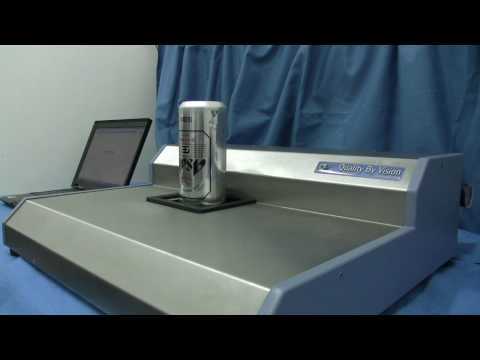 Manual – Bring cans to the machine, line them up and start the test – SEAM360 will produce a report and statistics graphs at the end of the measurement process. Automatic – SEAM360 grabs one can from each head every X minutes and tests all of them. If one of the cans is marked by a dimple as being from Head #1, SEAM360 will detect it and match that can with the correct head on the report! Detects and locates hard to find errors that can be easily missed in a seam test, such as compound buildups, variations around the seam, skids, wrinkle, and more! Less expensive than other fully-automatic seam testers and NON DESTRUCTIVE! and best of all … It’s non-destructive!